Steam has been increasing the number of sales per year drastically in the past couple of years. That's not necessarily a bad thing even though it could lead to fatigue in the long run. Anyway, games are discounted during that time, some up to 90% of their current sales price. It is great for games that you always wanted to play but did not want to pay the full price for. Chance is, that at least some of those games will be available on Steam so that you can purchase them for a discount. While you can just go ahead and purchase any game that you come across that sounds somewhat decent, it is usually better to have a plan before you dive head in first into the store. Why? Because you may end up buying games that you never play if you buy them left and right. If you have participated in a couple of sales you may know a few tricks that got you through the sale. I'd like to share mine with you as they may help you save lots of money and time. Discounts are valid throughout the entire sales period. Daily deals and Flash sales are a thing of the past. This means that there is no need to rush anymore, you can make a purchase any day and get the same discount as someone who made the purchase on the first day of the sale. Use Enhanced Steam if you are using Firefox or Chrome to access a game's price history, display if it uses DRM and highlight your wishlist items automatically in store. Look out for player packs. If you are playing with friends or have friends that are also interested in a particular game, try and find player packs which offer multiple copies of a game for a discount. You may save extra on those. Check out publisher bundles and game bundles. These offer better discounts usually. Especially game bundles may be worth it as they do include DLCs, add-ons and other items that you would have to purchase separately otherwise. Don't buy games you do not know without reading reviews. 24 hour sales give you enough time to read reviews on your favorite games blog or watch a video review on YouTube or another site. It helps to add games that you want to buy to the wishlist, especially if you are using the Enhanced Steam extension. It helps you keep an overview over games that you definitely want to buy. Check out all sales options before you hit the add to cart button. Games sometimes are offered with and without DLC, or in different versions, or as bundles. Make sure you check out all options that you have before you make a buying decision. Use the Steam app to stay up to date. The Steam app for Android and iOS provides you with store access even if you are not on your desktop PC. You can purchase any game from the app as well so that you do not miss out on any special offers just because you are not at home. Add funds to your wallet in preparation. You may want to consider adding funds to your Steam wallet before the sales period starts to avoid any issues with credit card or payment processing. Servers are usually overloaded during the sales period and this may help avoid this. Don't buy games during the last minutes or seconds of the sale. You may lose out on sales if servers cannot process the purchase in time or something unforeseen happens. Don't rush it. The first couple of minutes when new sales are added to the store usually overload the servers so that you may not be able to access the store at all. Just wait and relax and do not panic, there is enough time to look a the games on offer and make your picks. Set a budget. The best way to spend only as much money as you can spare is to set a budget before the sale starts and stick with it no matter how hard it may be. This goes along well with filling up your Steam wallet in advance, as it helps you keep an eye on the budget at any time. Trading Cards can be sold. If you don't collect them, you may want to sell them on the market to earn some money in the process. The price is highest on day one, and goes down quickly. So, sell early for maximum effectiveness. Steam sales can be very tempting and it happens that users buy games that they have no real interest in only because they are discounted. If you stick to the plan, you may end up spending less money for games that you are dying to play. Have any tips to add? Lets hear them in the comments below. 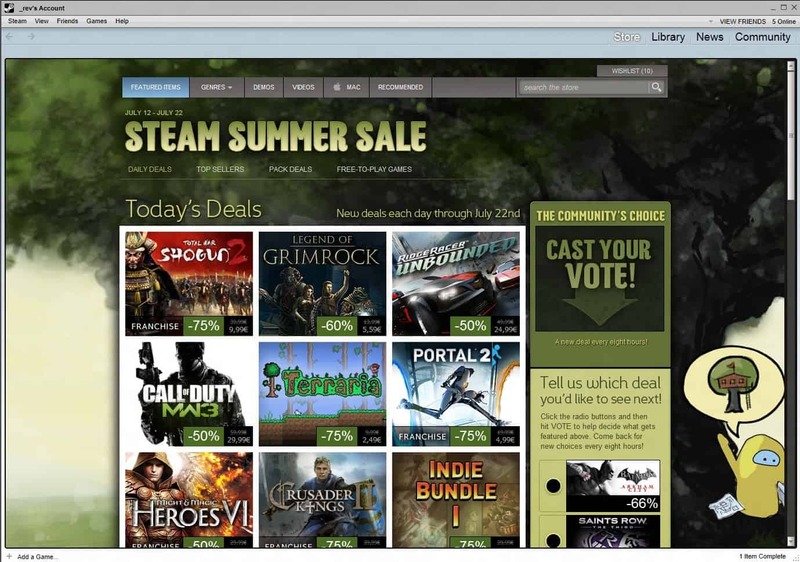 The guide provides you with a list of tips on making the most out of sales on the popular gaming platform Steam by Valve Software. what’s your stance in this martin? Great article. Thanks for the info on Enhanced Steam.